In a large skillet, heat oil. When hot add chicken and saute 4 to 5 minutes until about halfway cooked. Add mushrooms and continue to saute until chicken is lightly browned and cooked through (juices run clear). Stir in the milk, soup, mushrooms, pimentos, onion powder and pepper. Bring all to a boil. Cover skillet and reduce heat. Let simmer for 2 to 3 minutes. Stir together and serve. DIsh was tasty, but nothing spectacular. Will look for a better recipe. Very simple recipe. 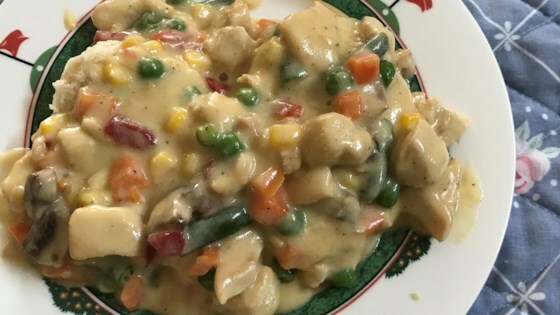 I substituted cream of chicken with herb and added celery salt, peas and real onions. Lightly season the chicken before cooking because that will give it the kick it deserves. this was good...i left my chicken breasts whole and grilled them and added to the sauce.